Could thermographic testing be your answer to cheaper utility bills? If you are one of the 66% of people worried about the price of energy, (Which? Survey, April 2017) then you should consider conducting a thermographic test on your property to identify any thermal inefficiencies it may have. Thermographic testing quickly and easily identifies hidden problems and variations in your properties airflow and insulation, which cannot be seen by the naked eye. By carrying out this type of test, you can detect anomalies within your property, which if addressed, could significantly reduce the cost of your energy and utility bills. In addition to this, thermographic testing can identify humidity levels in your property, diagnosing damp spots as well as blockages in plumbing and drainage systems. What is thermographic testing and why would it benefit me? Thermography is the measure of surface temperatures and is captured by either video or still cameras. The apparatus records the temperature variations of a building’s skin from white for warm regions, to black for cooler ones and quickly determines where air is leaking and heat is lost. Inspections benefit from being non-intrusive; no floors, walls or ceilings need to be disturbed to identify any thermal anomalies, excessive thermal bridging, air leakage paths or poor insulation within the building. The infrared cameras provide comprehensive details, superb visuals and quantitative evidence of the causes of suspected problems. 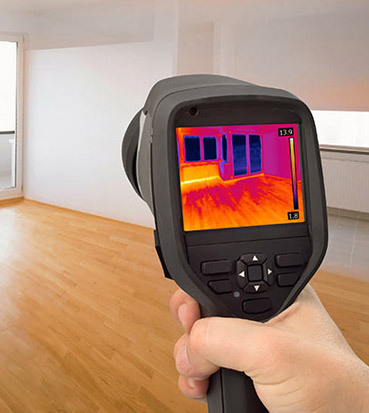 By conducting a thermographic test, we can identify inefficiencies and recommend how to make your home and property more energy efficient, in turn, reducing your energy bills. For a free, no obligation quote on thermographic testing for your residential or commercial property, or to simply discuss your requirements, call us now on 01403 253439 or email info@falconenergy.co.uk. Alternatively, fill out our contact form here and a member of the Falcon Energy team will be in touch.